Turkey has belittled the EU in a week of macho posturing, but strategic and economic relations go beyond the current rhetoric. Two Turkish jets harassed a Greek helicopter carrying Greek leader Alexis Tsipras over the Aegean on Tuesday (17 April), the Greek defence ministry said. Turkey's National Security Council also renewed a national state of emergency for the seventh time since the failed coup in 2016. 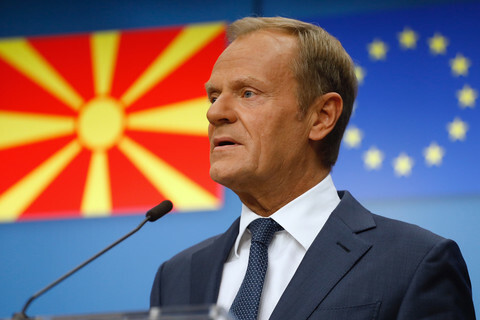 That appeared to be Turkish president Recep Tayyip Erdogan's reply to a European Commission report, out the same day, urging "good neighbourly relations" with Greece and to "lift the state of emergency without delay". 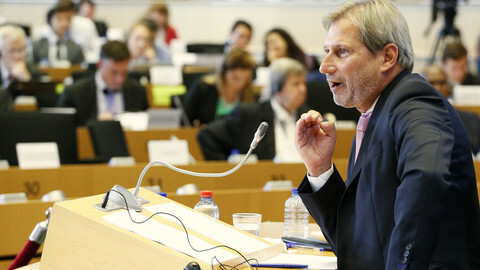 The commission said Turkey "continues to take huge strides away from the EU, in particular in the areas of rule of law and fundamental rights". It also urged Turkey to free two Greek soldiers, whom it has held without trial since March. "Turkey isn't the one moving away from the European Union. The side that is not objective and is, unfortunately, biased and unfair, is the EU", Bekir Bozdag, an Erdogan spokesman, hit back from Ankara the same day. 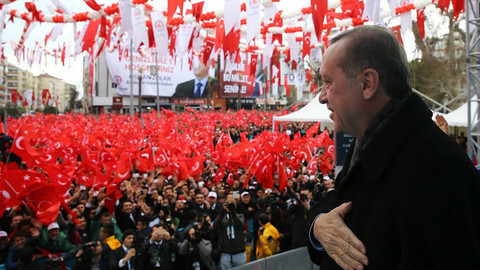 The commission report included "baseless allegations and accusations taken from obvious circles," the Turkish foreign ministry added, alluding to the Fethullah Gulen movement, an Erdogan rival blamed for the 2016 coup. The anti-EU pushback began already on Monday, when Turkish foreign minister, Mevlut Cavusoglu, belittled EU institutions that criticised Turkey. "When the European Parliament makes a statement, you think that it is the opinion of the entire European Union? 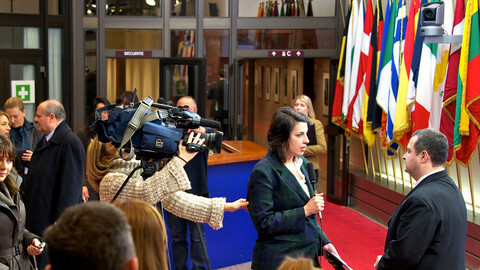 So you should not make a big deal of all these statements," he said while visiting the Nato HQ in Brussels. He also belittled French president Emmanuel Macron and boasted of "strong ties with Russia". Macron had lied about not being invited to an Iran-Russia-Turkey summit and about a Turkey-Russia rift for the sake of "populism", Cavusoglu said. "If a president does not tell the truth we have to tell the truth … I would like to invite him to be more serious," the Turkish minister said. "Our relations with Russia are not as weak as can be severed by the French president. We have strong relations with Russia," he added. The commission report put numbers on Turkey's strides away from EU norms. Erdogan has arrested 150,000 people and dismissed 110,000 civil servants since the coup, it said. He arrested nine opposition MPs, one of whom he jailed for five years, and stripped ten others of their seats. He jailed 150 journalists, as well as human rights defenders, such as the Turkish chair of Amnesty International. He also shut down 110,000 websites and 9,200 Twitter accounts and jailed social media users, many of them for "insulting" his name. His macho diplomacy was matched by chauvinism toward minorities at home, the commission said. It urged Erdogan not to use disproportionate force against Kurdish separatists. It also spoke of "anti-semitic rhetoric" in state media and of harassment of gay rights defenders. "Under the currently prevailing circumstances, no new chapters are considered for opening," in EU-Turkey accession talks, the commission said. 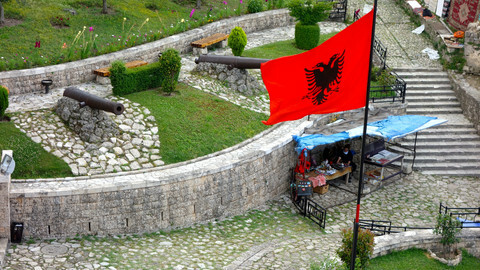 The report came out the same day the commission advanced EU talks with Albania and Macedonia, in a speed-up on enlargement that excluded Turkey. It also came out amid Nato tension over Turkey's plan to buy missile defence systems from Russia. 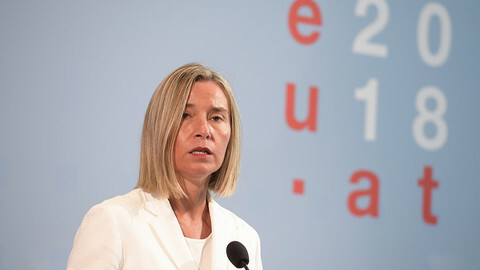 The EU and Turkish statements pointed to the depth of the relationship despite the surface turbulence, however. 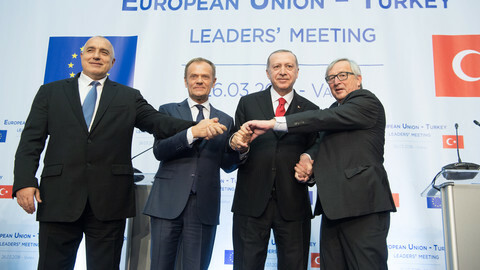 "Turkey remains a key partner for the European Union," the commission report said in its opening line. "Despite all the negativity in the EU's approach, EU membership continues to remain our strategic priority," the Turkish foreign ministry said. Nato also put on a show of support for Turkey this week, with alliance head Jens Stoltenberg meeting Erdogan in Ankara on Monday as well as Cavusoglu in Brussels. 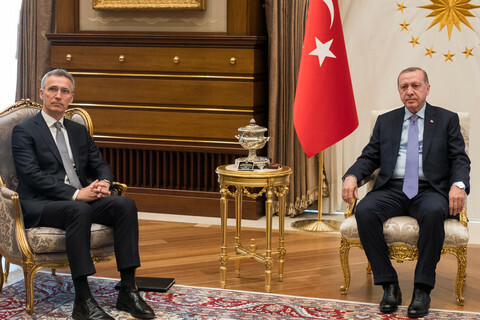 "Turkey is a highly valued Nato ally, and Turkey contributes to our shared security, our collective defence, in many different ways," Stoltenberg told the Turkish minister. Meanwhile, Cavusoglu's own criticisms were mild compared to a nadir in EU-Turkey relations last year, when Erdogan called the Dutch government "Nazis". "Our strong relations with Russia are not an alternative to our relations with Nato or France or the USA," Cavusoglu told Stoltenberg. The commission report also put numbers on what Turkey was doing for the EU on security and migration. It said Turkey had banned 38,000 suspected "foreign terrorist fighters" from trying to enter Syria and Iraq, deported 3,500, and detained 1,030 more. The EU-Turkey deal on stopping Syrian refugees from going to Greece had seen the number of daily irregular crossings fall to 80 from almost 1,800 in early 2016, it added. The deal "continued to deliver results," the commission said, amid machinations to renew the accord. Christos Stylianides, the EU humanitarian aid commissioner, urged Turkey to free the two Greek soldiers at a debate with MEPs in Strasbourg on Tuesday, but he also defended the migrant deal. "Not a single cent, not a single euro from aid given to refugees in Turkey goes to the Turkish state. I say this categorically. I say this as a commissioner responsible for humanitarian aid," he said. The EU has, for its part, paid out €2bn to help Turkey take care of the 3.5 million Syrians and 365,000 refugees from other places who now live in Turkish camps - the largest refugee population worldwide for the third consecutive year. But EU-Turkish financial ties ran much deeper, the commission report noted. It said Turkey's economy and financial sector, a pillar of Erdogan's popularity, had shown growth and resilience despite the volatility, but it said Turkey's prosperity depended on its EU ties. "Two out of five goods traded by Turkey come from or go to the EU and over 70 percent of foreign direct investment in Turkey originates in the EU," the commission said. Bulgaria's prime minister Boyko Borisov described a meeting at the Black Sea resort of Varna between the presidents of Turkey, the EU council, and the European commission as "charged with great tension." Disputes remain far from resolved. 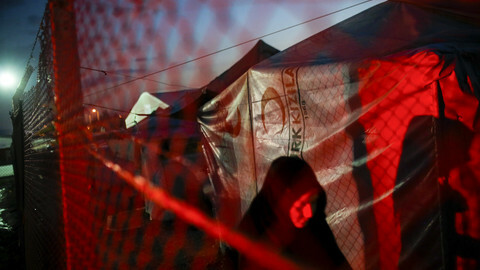 Money should flow despite concerns about the Turkish regime, the Commission said. EU should "pressure" African states to take back unwanted migrants, it added.